Here’s the whole Writing in the Works gang after our fourth fabulous annual show. From left to right, this year’s readers Susan Calder, Inge Trueman, Naomi K. Lewis, myself and Leslie Gavel; our MC and chief helmsperson Rona Altrows; and, down in front, this year’s provider of refreshments and general support, Elaine Morin. We had an excellent afternoon of readings, book sales and hanging out, and had more fun later at the Rose and Crown. Many thanks to Leanna McLennan and Elaine’s hubby Scott for their help with the refreshments, to Shelf Life Books for book sales and to Calgary Public Library for once again providing us with a home. Thanks to Jan Markley for again acting as official event photographer. And thanks to everyone who came out to hear us! It’s my great pleasure to announce a guest posting here at TFBCH by my friend and colleague, Betty Jane Hegerat. I asked her a couple of questions about her amazing new book, The Boy (Oolichan Books), which she has graciously responded to below. Enjoy! BJH: Lori, thanks for inviting me to your blog. I know you’ve been hard at work on a novel for many years, so I’ve been looking forward to talking with you about that experience of living with a book-in-progress. I believe your novel has involved research as well, but I suspect that you enjoy that part of the process more than I did in exploring this murder story. LH: It seems to me that this would be a difficult book to write. What was most difficult about writing it? BJH: The real story is a horrible one, and finding the shape of the book was more of a challenge than I was looking for, but I think the most difficult part was the wrestling with my right to tell the story. Yes, I am a writer, a storyteller, and this is what we do, but I have never drawn so obviously from the lives of real people. When I write fiction, I borrow and steal, disclose secrets and tell lies—all without apology. If I do the job well, the art that comes out of the chicanery is unrecognizable as real life. 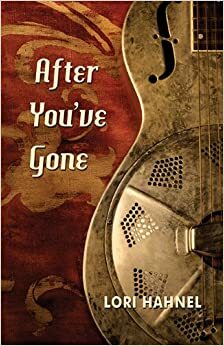 But I knew as soon as I began to sift through the information about the Cook family that I would never be comfortable playing fast and loose with the details of their story. And yet, I was drawn to the family and their fate more than I was to the legal details and Robert Cook’s fate. I wanted to make sense of how something so dreadful could befall an ordinary working class family in small town Alberta. And of course, to suggest that there was even a fragment of sense to the events in that small white house on June 25, 1959, seemed an affront to the memory of these seven people. If I’d been able to walk away from the story I would have done so, but whatever it was that alternately compelled me and repulsed me, was the strongest obsession I’ve ever experienced in my writing life. LH: How did writing The Boy differ from writing a novel? BJH: In some ways writing The Boy was quite similar to writing my previous two novels. I have a tendency to call every new idea a “story” and pray that it will be short, because short fiction really is my first love. Even before I was blindsided by the Cook story, I had begun to fear that Louise’s problem was not going to be resolved in anything close to 3000 words. Then the fiction began to get entangled with the 50 year old murder story and I had a mess on my hands that was unlike anything I’d dealt with before. I’m used to having messy first drafts, and doing major revision through many more drafts, but normally there is some cohesion, and some order to the experimenting. Whose story is it? Who’s narrating? From what vantage point? Is the voice consistent? Where is the energy coming from to drive the story? I didn’t even attempt to ask those questions of the reams of material I ended up gathering around the Cook story. When I finally accepted that the work was going to have to include both the fiction and the non-fiction, the challenge was to find a way to fit it together. I was definitely not a quick study on this project, and it took me a couple of years to realize that I had the structure all along. Louise’s story had turned into a novella, and if I could stitch the non-fiction to it like Peter Pan’s shadow, I might just be able to pull it off. The Boy is being marketed as fiction for a number of reasons, even though it doesn’t fit any definition of the novel that I’ve ever seen. But neither does it fit into non-fiction because of the embedded fiction. It’s a strange book, but it is what it is. LH: Thank you, Betty, for the insights into the writing of this interesting, amazing, and yes, kind of strange book. I’m almost done reading it, and my sense is more that The Boy is unique than strange. I have never read a book quite like this. The approach reminds me a little of Truman Capote’s In Cold Blood. I think you may have written the first book in a new genre! Whatever pigeonhole it does or doesn’t fit into, though, I can say that it is mesmerizing. Congratulations again on its publication! And thanks for dropping by and talking about it. And another special treat, folks: an audio clip of Betty reading from The Boy over at her blog. Click on “other people’s lives” And enjoy! 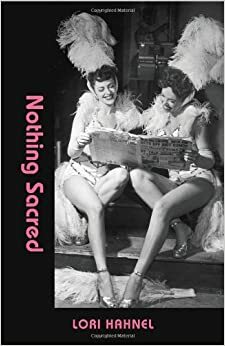 Thanks to Robin van Eck for this great review of Nothing Sacred at Suite 101. It’s so nice to get exposure and it’s always interesting to me that different reviwers focus on different aspects of a book. Very nice. Less than a week to go until this year’s edition of Writing in the Works. 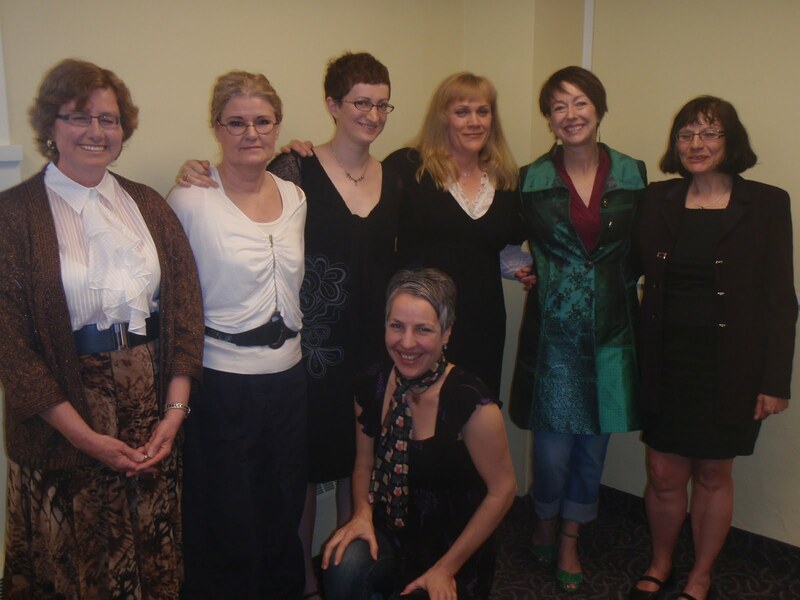 That’s Susan Calder, Leslie Gavel, Naomi K. Lewis, Inge Trueman and me doing readings, and hosted by MC Rona Altrows. That’s next Saturday, May 14, at 1:30 at Memorial Park Library, 1221 – 2 St. SW. Readings, refreshments and book sales by Shelf Life Books — sounds great! And happy Mother’s Day to my Mom and all my mom friends out there! I’m enjoying my Mother’s Day and I hope you are, too!